How can I be sure that this dish table is compatible with my commercial dish machine? Dish Machine Brand: This is the name of the manufacturer of your dish machine, such as CMA, Jackson, Hobart, etc. Model Number: The placement of this information will vary by manufacturer, but it is often located in product literature (manuals or specification sheets) and/or somewhere on the unit. Please note that some dish tables must be modified to ensure that they will fit with certain brands of dish machines. Occasionally, this service will require an upcharge depending on what modifications need to be made. How do I know which side of this dish table has legs? When facing the front side of your installed dish table, a left-side table will have legs on your left side, while a right-side table will have legs on your right. 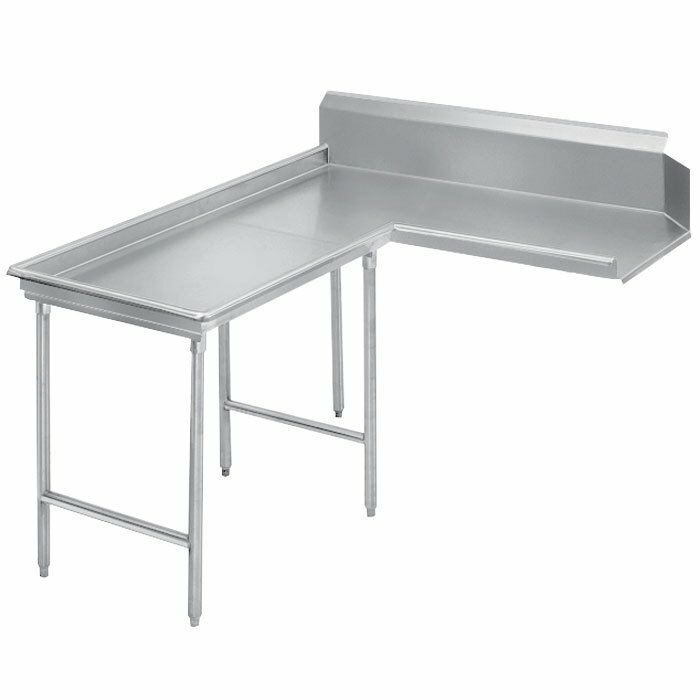 Use this Advance Tabco DTC-G30-84 7' spec line stainless steel "Island Clean" dishtable to hold clean racks of dishes when they come out of your dish machine and improve efficiency in your establishment! This L-shaped dishtable boasts a durable 14 gauge type 304 stainless steel top sure to withstand the rigors of constant use, and to protect your walls it features a 10 1/2" backsplash on one side with a 2" return. 1 5/8" diameter stainless steel legs with welded cross bracing and adjustable stainless steel bullet feet provide support for the whole table, and its stainless steel gussets are welded to a support channel for added reliability. Additionally, all welded areas are blended to match adjacent surfaces for a sleek and clean appearance.